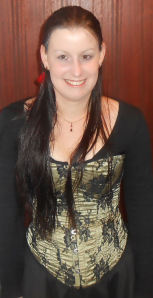 Today I’m bringing you an author interview from the lovely Stacey Jayne McIntosh. Stacey is a close friend of mine, and a fantastic author. I have been a pretty slack friend though considering this is the first Author Interview I have done for her! But better late than never right? At thirty-one, her first love has always been writing and she now has six short stories: “Freya”, “Blood Sacrifice”, “Fallen Angel”, “Life or Death”, “Exiles of Eden” and “Morrighan” published in various anthologies, as well as having self published one novel, “Solstice” in 2013, along with two earlier novels that are available for free on Smashwords.com.